Brussels sprouts are roasted to crispy perfection in olive oil and a variety of spices. Served atop a bed of steamed kale and tender sweet potato noodles, this is the perfect detox from a heavy thanksgiving meal. "Gobble Tov! You and Food Coma are a match!" ^what my J Swipe* app was so kind to notify me of yesterday, as I was en route to Thanksgiving at my friend Dan's house. And boy, was it right. After Brie and Pear Puff Pastry bites, all the turkey, stuffing, corn pie, and sweet potato casserole in the world, the DESSERTS (!!! ), and wine on wine, I'm dragging a little today. Read: sitting on my couch in my PJs watching a Miley Cyrus movie that was definitely designed for 13-year-olds. I need a recharge, and this roasted vegetable salad is just the thing. Roasted veggies are relatively hands off, so you have plenty of time to watch your favorite Christmas movie while your Brussels sprouts are in the oven. Plus, you'll get an arm workout spiralizing the sweet potatoes! Perfect way to burn off a little of that pumpkin pie. I had enough to eat some every day for a full week, so this was a huge work-from-home time saver. Make it this weekend and have all your meals next week ready to go! First, preheat your oven to 400F. Rinse your brussels sprouts and spread them out on a cutting board. Trim the bottoms off, and slice the brussels sprouts in half. Place the sliced brussels sprouts in a bowl. 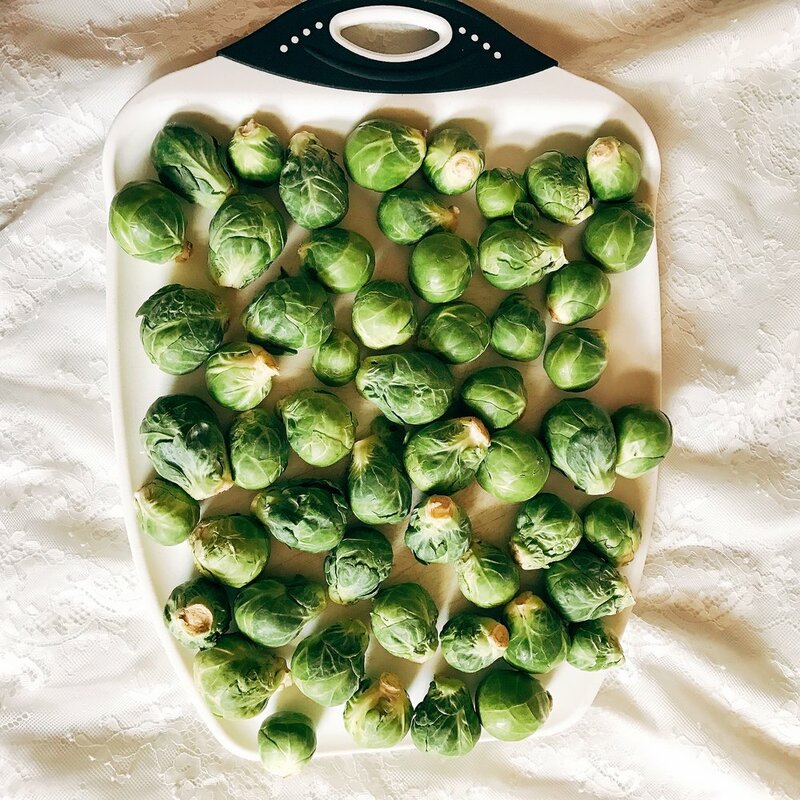 Season your brussels sprouts with 1 T olive oil, salt, and seasoning, then spread them out on a foil-lined baking sheet. Let roast in the oven for 20 minutes while you prep your sweet potato noodles. Wash and peel your sweet potatoes, then microwave them for 2 minutes to soften them up enough to spiralize. Spiralize the sweet potatoes by first cutting them in half, then cutting off the ends to obtain a flat surface. This might take a few tries to get a hang of, but don't give up! It's worth it. Once you have all your sweet potatoes spiralized, prep your kale by washing it and tearing the leaves into smaller pieces. Brussels sprouts are ready! Just LOOK at these crispy babies. Mmmmm. Heat a large pan over medium-high heat, and add the remaining olive oil. Once the oil is hot, add the minced garlic. Stir until fragrant. In a small bowl, combine the honey mustard dressing and vinegar. Mix until uniform. Add the kale and sweet potato noodles to the pan, then top with the dressing mixture. Cover pan to keep the moisture in, stirring occasionally. Once the kale has wilted and the swoodles are tender, add the brussels sprouts and mix to coat. Serve the salad with your toppings of choice - I've been trying to eat a more vegetarian diet (about that turkey last night...), so I went with fresh mozzarella and dried cranberries. Walnuts, chicken sausage, and goat cheese would also be great!